It’s September 1st, and what that means when you live on the Amalfi Coast is that you have survived the August heat and invasion of tourists. While there hasn’t been a break in the high temperatures, I can say there is a whole lot more room to breath here now on the Amalfi Coast. (And park and walk and lay on the beach…) Over at Bell’Avventura, Scintilla recently shared a fun post called You know that it’s August in Positano if … that is a must read for any fans of the Amalfi Coast and anyone who has experienced August here. She also has up a beautiful new banner image of bougainvillea that you have to check out. 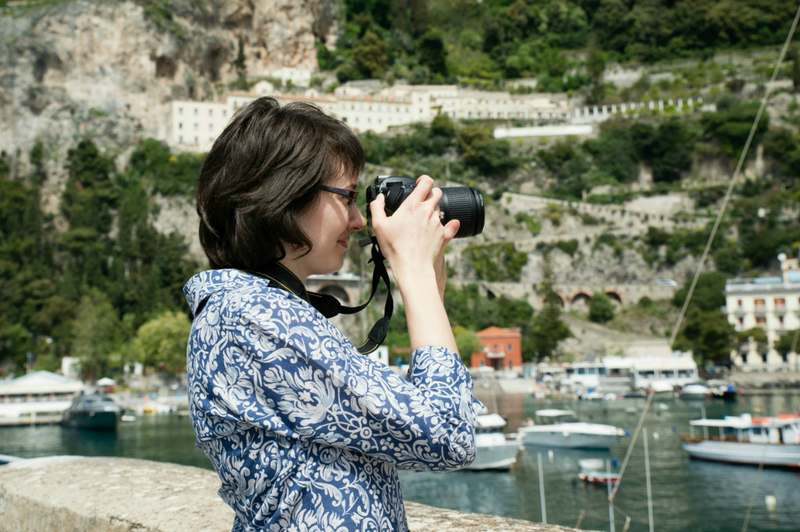 Speaking of new banner images, the first of the month means a new one here on Ciao Amalfi. This month is the rich blues of the sky and sea in Conca dei Marini. Located just west of Amalfi, I’ve written about the Church of Sant’Antonio in Conca dei Marini and Conca dei Marini in the Springtime and the Grotta dello Smeraldo (Emerald Grotto). Both of those posts are from my Tempting Tuesday series, which will resume next week after my August break. In the meantime, I hope you enjoy the late summer sun on the beautiful cove in Conca dei Marini! I know most of you who read this blog are big fans of Italy, and you probably already have a few (or more!) of your favorite Italy blogs you visit regularly. Well, be prepared to find more! This week I want to give a big, boisterous Italian-style Sunday Shout-out to Italytutto.com, a blog for all lovers of Italy blogs. If you had something to do today, scratch it off your list and head over to Italytutto.com and start exploring the wealth of Italy themed blogs that have been compiled there along with comments and indexes. Curious out a region in Italy, or are you planning an upcoming trip? Check out Italytutto.com’s list of blogs on Italy by region. Passionate about Italian food and wine? You aren’t alone! If you need some inspiration about what to prepare for dinner tonight, check out Italytutto.com’s list of Italian food & wine blogs. While most Italy bloggers include beautiful photos in their posts, there are a number of blogs dedicated solely to photography. Visit Italytutto.com’s list of photoblogs in Italy to travel around this beautiful country in pictures. Grazie mille to Italytutto.com for all the hard work you do keeping the most up-to date listing of current blogs for lovers of Italy! For those Twitter fans, you can find Italytutto.com there: @italytutto. Buon divertimento … Enjoy!! This week I have a series of shout-out’s for people who have recently enhanced Ciao Amalfi or helped make my blogging life a heck of a lot easier. The first goes to the wonderful team at BlogHer, a great online resource for women bloggers. Head over there and explore their online community of great writers and bloggers! You may have noticed the BlogHer ads that appeared over there on the right on Ciao Amalfi a couple of weeks ago. While applications for BlogHer ads are currently waitlist only, I am very honored that BlogHer made an exception and wanted to include my blog in their advertising community. Thanks a million to the BlogHer team for the opportunity to host your ads, and for making the whole process so easy to use and understand. Grazie mille! Another shout-out goes The Blogger Guide, a great blog that has easy to use illustrated tips for using Blogger. When I needed to make layout changes recently, I found a great tutorial that took me step by step through changing Ciao Amalfi from a two column layout to a three column layout. They even share the images to use for free! So a great big thanks to The Blogger Guide for helping this html novice update my template so easily and painlessly. My final shout-out this week goes to Scintilla over at Bell’Avventura, who answered my plea for help on Twitter about watermarking photos. (Many thanks to everyone who responded and offered great suggestions for me to try out!) I had been using various online websites for watermarking, but hadn’t found one that didn’t drive me crazy in various ways. Many thanks to Scintilla for suggesting Windows Live Writer, which has been a dream to use so far. I can upload photos, edit and watermark them, do all sorts of fun things (head over to Bell’Avventura and see the creative things she has been doing with photos recently), write and preview my posts, and then publish all directly from Windows Live Writer. I am still adjusting to the change, but so far I am very pleased and find it easier to use than the Blogger pages for composing posts. Grazie mille Scintilla! NOTE: The Sant’Antonio procession in Amalfi yesterday was out of this world amazing! I felt very honored to be on the first boat in the procession with the statue of Sant’Antonio. I have some incredible photos and videos to share with you all. It will take me a couple of days to get the videos uploaded, but it will be an exciting week coming up on Ciao Amalfi! Ready for Summer on the Amalfi Coast! June has arrived, and with it comes warm the summer days pefect for enjoying the beaches on the Amalfi Coast and the fresh summer produce of Campania. I am ready! To celebrate here on Ciao Amalfi, I have replaced the banner photo of the Amalfi Coast on the top of the blog to a photo I took recently in Amalfi. It captures the excitement of the beginning of summer for me! I will be changing the banner image every month now to highlight different seasons and locations around the Amalfi Coast. I hope you enjoy the new photos each month! After receiving such good feedback last week on my ItalyItalia.com post, I wanted to share with you all my new Sorrento Travel Guide on ItalyItalia.com. Head on over to read about the origins of the heavenly Delizia al Limone dessert and some of my favorite sights in this beautiful city. Coming up next will be a Travel Guide for Naples and then a highlight piece on the Duomo of Amalfi. Enjoy! Note: As you may have noticed, I have been making some layout changes to Ciao Amalfi over the past two days. This will be continuing over the next week, and I apologize in advance if you visit and find things a bit wonky or can’t locate something while I am making changes. By this time next week I will have a better layout for my blogroll, webcams, and other fun Amalfi Coast links. Stay tuned & thank you for your patience!